As high school students get closer to graduation, you’re likely to hear declarations that I could never go to a college that small or I could never go to a college that big. Does college size really matter and, if so, matters for what? So why would college size matter? Theoretically, you would think because it would influence the type of education opportunities available. The presence of the opportunities should make it more likely for students to graduate and pursue their post-graduation plans. In other words, it doesn’t matter how wonderful the opportunities are if the student never graduates. Is college size a significant factor affecting the education opportunities and ultimately the graduation rates? Does the personal attention advertised by small schools result in higher graduation rates? Are students who attend larger schools more likely to get lost in the system and less likely to graduate? Probably-but not because of size alone. Larger schools are more likely to be public schools. Of the 61 schools with an undergraduate population of over 20,000, only four are private schools and that includes the Western Governors University. There are 129 public schools with between 10,000 and 20,000 full-time undergraduates but only 15 private schools. For schools that have less than 5,000 undergraduates, 848 of them are private and 330 are public. Therefore, larger schools will generally have the characteristics of public schools including less funding, larger class sizes, and more teaching assistants. Yet none of these factors alone will determine a college’s graduate rate. In general, as the school’s undergraduate population passes 5,000, there will be a decrease in graduation rates among otherwise similarly situated schools. You see another change at 10,000. This means that if the only difference between two schools is size, you will probably see a difference in graduation rates. The following two graphs show such non-statistically significant trends. 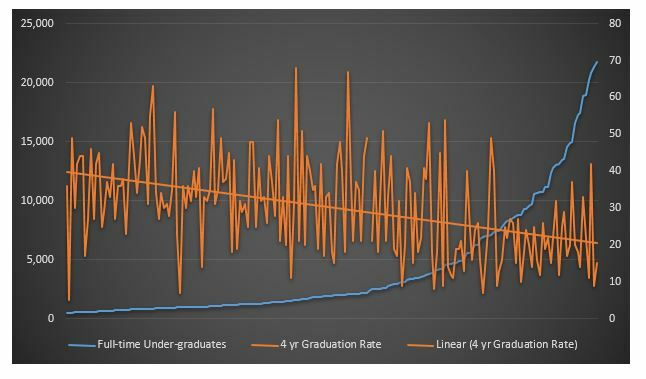 However, the jagged orange graduation line indicates that all other things being equal is a pretty big if. Let’s face it. In real life, that “if” doesn’t exist. 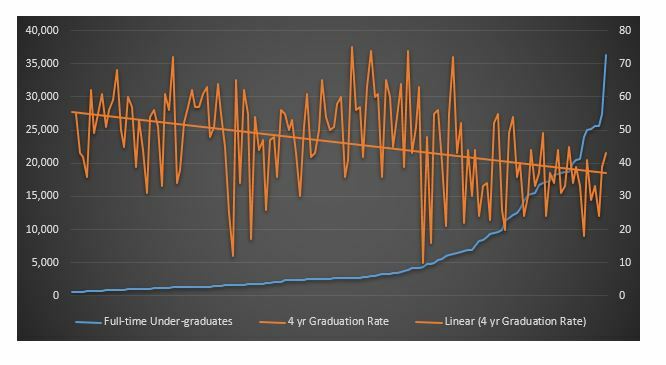 Not that you don’t see a decrease in graduation rates as school size increases, but rather that college size is not the simple explanation for the differences. In other words, you can’t guess the graduation rate simply by knowing the size of the school. So let’s take a look at some real colleges and their graduation rates. The following is based on data from the DIY College Rankings College Search Spreadsheet. Among these five schools, the four-year graduation rate varies from a low of 11% to a high of 33%. Given that it’s the smallest school that has the lowest graduation rate, there is something more than college size that determines graduation rates. Just as you can find low graduation rates at large public universities, you can find low graduation rates at smaller, private colleges. Consider a group of five private schools with less than 2,000 students where the difference in student population is less than 88. The four-year graduation rates vary from 22% to 72%. Yet, even as important as graduation rates are, after all that is the point of college, graduation rates or size are not the only reason to choose one school over another. Among these example schools, The University of Houston is the only school offering Bachelor degrees in Chinese and Arts, Entertainment and Media Management. Consumer Services and Advocacy can only be found at Texas State. If you’re interested in Audiology/Audiologist then you’ll need to go to the University of North Texas. Texas Tech offers Agronomy and Crop Science and Applied Horticulture/Horticulture Operations. For those interested in undergraduate Computer Systems Security, UTSA is the place to be. You’ll find Theatre Arts Management at Austin College and Education of Speech Impaired at Our Lady of the Lake University. 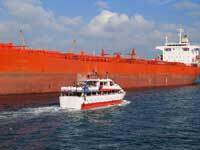 Only LeTourneau University offers majors in Metallurgical Engineering or Air Traffic Control. If you’re looking for Bioinformatics, then you need to look at the University of St. Thomas. Austin College offers a January term with unique opportunities students wouldn’t otherwise have and over 80% of the students at the University of Dallas spend a semester at their campus in Rome.